Free-to-play Cyber Arena due out on September 21. 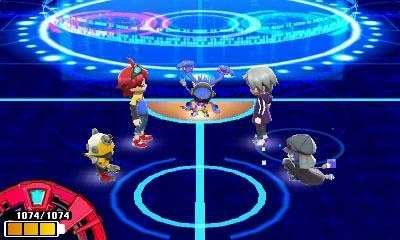 Digimon Universe: Appli Monsters will launch physically and digitally for 3DS in Japan on December 1 for 5,700 yen, Bandai Namco announced. The download version will be sold at a discounted price of 5,130 yen until December 28. As previously announced, the free-to-play Digimon Universe: Appli Monsters Cyber Arena will launch via the Nintendo eShop in Japan on September 21, and the save data from the free-to-play game is compatible with the December-due full release. Appmon Chips are also compatible, so you’ll be able to use your Onmon Appmon Chip to befriend him in the game before it launches.